I'm so excited! I'm getting married. I'm wearing the most gorgeous gown, I've rented the banquet room at Little Lake Lodge, a charming hotel nestled beside a lake in the woods of northern Wisconsin, and I've planned a fabulous reception! Gauzy draperies will disguise the log walls. They'll hang from the ceiling to the floor all around the room. We'll have delicious food, a live band, and one of the most fun features will be the donut wall. I'm a sweater designer, and I'm living a dream. I sell my sweaters along with other beautiful clothes in my own boutique, Dressed to Kill. A couple of really nice people, Emily Westhill and her father-in-law, Tom Westhill, own Deputy Donut, a donut and coffee shop across the alley from Dressed to Kill. While reading wedding magazines, I saw this wonderful idea of having a wall of donuts at your wedding reception. Emily and Tom were very enthusiastic, and they're making one for my reception! Our reception, I should say. Did I mention that I'm marrying Roger Banchen? The donut wall will be the late night dessert station. Emily and Tom will set it up before the reception, and Emily will come back at ten at night to keep it stocked. 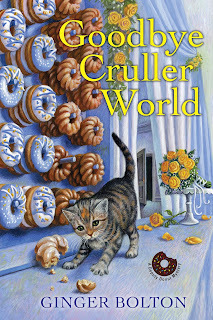 Crullers are my favorite donut, so we're having lots of those. Roger likes raised donuts dusted with powdered sugar. We're also letting Emily and Tom decorate donuts with our theme colors--periwinkle, white, and gold. It will be beautiful and delicious, and I think it's a fun touch that will make the occasion even more special. What flavors of donuts are your favorites? 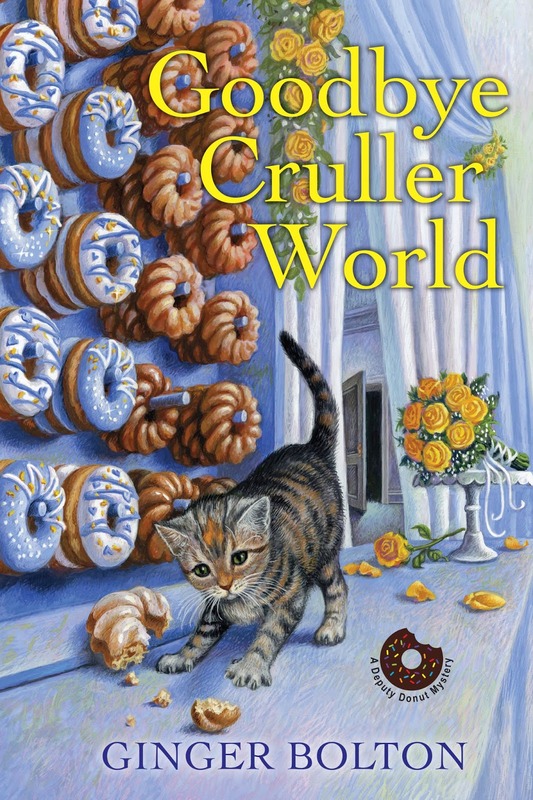 Goodbye Cruller World, the second book in the Deputy Donut Mystery series, will be on store shelves on August 28. Enter today's segment of The Killer Characters Cozy up to Summer Giveaway! 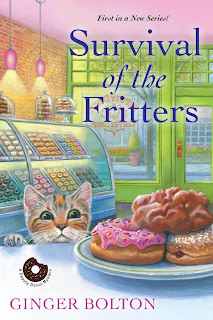 Tell Jenn about your favorite donuts in the comment section below, and you could win a copy of the first book in the series, Survival of the Fritters. If you already own Survival of the Fritters, you may choose a book from the Threadville Mysteries by Janet Bolin. I like a good old fashioned cake donut with Coffee! I love Boston Cream do nuts. They are the best. A warm glazed donut from Krispy Kreme can't be beat! I I have so many favorites! Some of them are maple, blueberry (with sprinkles of course)! And Cherry! I love a glazed donut smothered in chocolate. Your covers are gorgeous! Cruellers for me, too. But really, hard to pass up most any kind of donut! Thanks for the giveaway. Do I have to choose just one??? Ugh...okay I'm going with maple bars. But really we just love donuts. hehe. I loved glazed, raised donuts, when I wasn't gluten free. Now, I settle for any gluten free donut I can get my hands on!! ljbonkoski@yahoo.com. Thanks for the chance to win!! Years ago I found a farm stand kind of place in Armonk, NY that made fresh donuts. You saw them floating along in the hot fat. They were crunchy on the outside and soft on the inside. Simple perfection. I haven't found any that good since. Count me in for the donut wall! Chocolate cake, blueberry cake, & plain cake are my favorites. My favorite donut is the old fashioned sour cream donut. Love the donut wall idea. I used to love the vanilla creme filled from Dunkin Donuts. Now I go for the blueberry glazed cake from my local donut shop. Oh, how to just select one favorite...can't do it! Glazed devil's food, maple bar, or apple fritter, depending on the day. Thank you for the chance to win! Congratulations on your new book! I love glazed maple bars. Of course there is always room for an apple fritter or two! Thanks for a chance to win. I like a warm cinnamon and sugar donut. My fAvorite is a raspberry jelly filled bismark!!! So good!!! i love lemon filled donuts but they are hard to find these days! Thank you all for your comments and suggestions. Some of those flavors might show up in a Deputy Donut Mystery. Many already have! The Random Number Generator picked MamaHen. Congratulations, MamaHen. 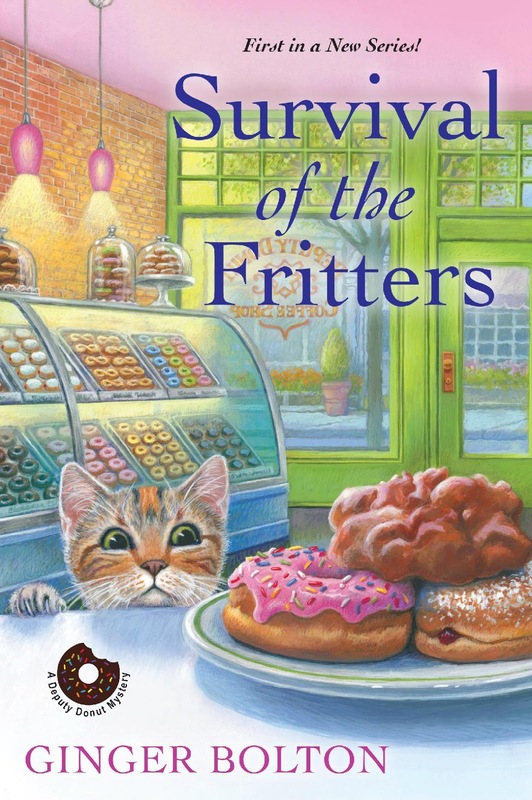 You will receive a signed copy of Survival of the Fritters.